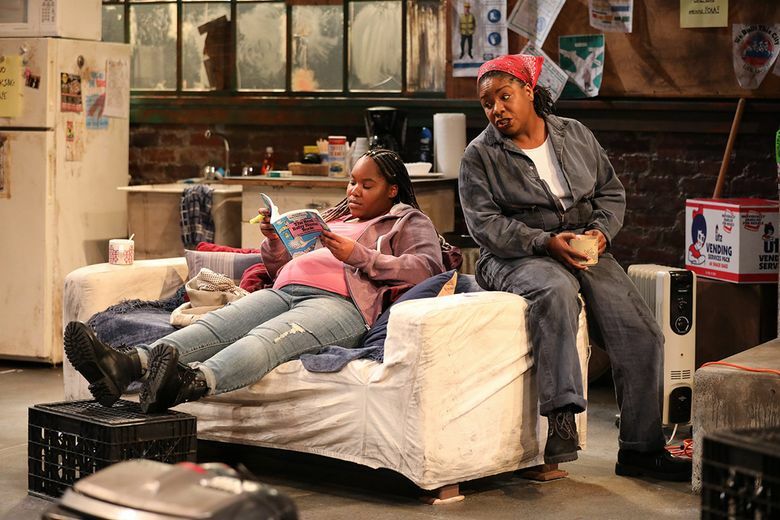 "Skeleton Crew," part of Obie Award-winning playwright Dominique Morisseau's three-play cycle set in Detroit, is full of humanity and heart, asking us, in a system that prizes winners above all, what each of us would sacrifice for the other. There is a moment in ArtsWest’s production of “Skeleton Crew” when actor Tracy Michelle Hughes is alone on stage, music playing in the background, simply applying lotion. Just that. But the delight with which she does so — slathering a bit up and down her arms while grooving to the music — connects us instantly to her buoyant joy. This play — about a quartet of workers at one of Detroit’s last auto-stamping plants — is full of such small moments of character and connection: the microwaved meal shared between two co-workers; the sweet smile of a young, pregnant worker as she describes a dream; the affectionate teasing between fellow workers over a game of cards in the breakroom. Those moments let us peek into the souls of these characters and experience their warm connections to each other — before those connections start fraying and tearing, as rumors spread that the plant may be shutting down. 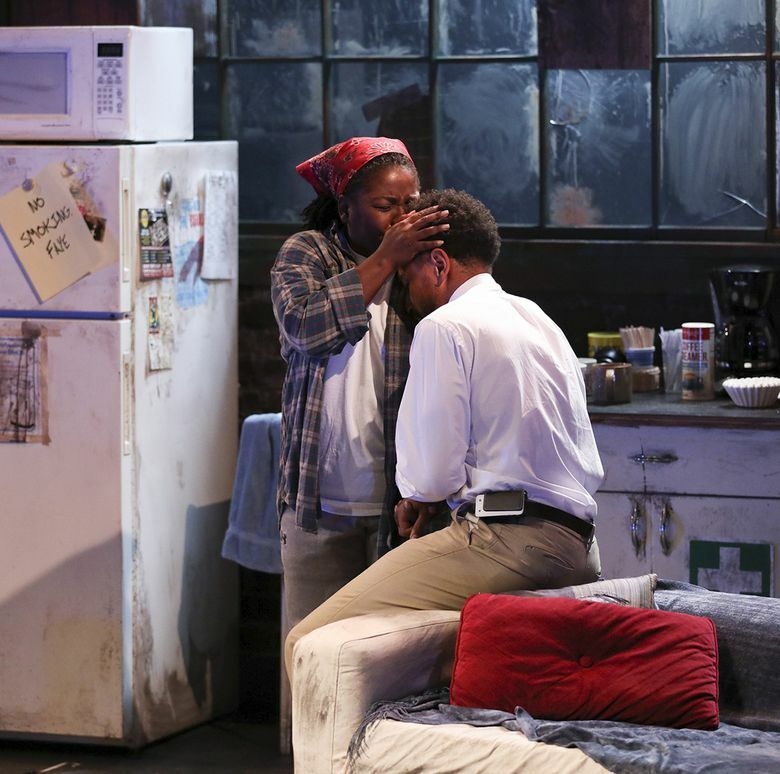 “Skeleton Crew,” part of Obie Award-winning playwright Dominique Morisseau’s three-play cycle set in Detroit, is full of humanity and heart, constantly raising questions about what we owe each other, even if our own situations are precarious, and the price on the soul for working in a system in which industries — and workers — can easily become obsolete. Though set in 2008 during the Great Recession, the dilemmas and questions remain vitally relevant, even in — or perhaps especially in — our highflying tech town where so many are down and out, or teetering one unfortunate incident away from being so. Anchoring the quartet is Hughes’ Faye, a woman who’s worked at the plant for decades (“I know everything about this place. The walls talk to me,” she says) — a self-described survivor, she’s hoping to hang on just a little bit longer because, as she notes, a retirement package at 30 years is different from one at 29. She has a strong relationship with Reggie (Allen Miller III), a manager who started out as one of the workers and now wrestles with where his loyalties lie. Young Shanita (Allyson Lee Brown), meanwhile, who is pregnant and single, is still optimistic, taking pride in the work that she believes will be there in the future. And young Dez (Charles Wright), frequently teasing and prone to challenging authority, has his own dreams of opening an auto body shop someday. Given ample room to breathe by director Jay O’Leary, and strong performances from the actors, the characters develop organically, their relationships playing out in the worn-but-comfortable-looking breakroom of the auto-stamping plant (set by scenic designer Burton Yuen). If the first act takes a bit to get going, it’s still a pleasure to spend time in these characters’ company and to listen to Morisseau’s language, which flows from everyday chitchat into poetry and back again. And it sets us up for the emotional wallops that come in the second act. “Any moment any one of us could be the other,” she says. This is, ultimately, a deeply moving play that asks us, in a system that prizes winners above all, what each of us would sacrifice for the other.